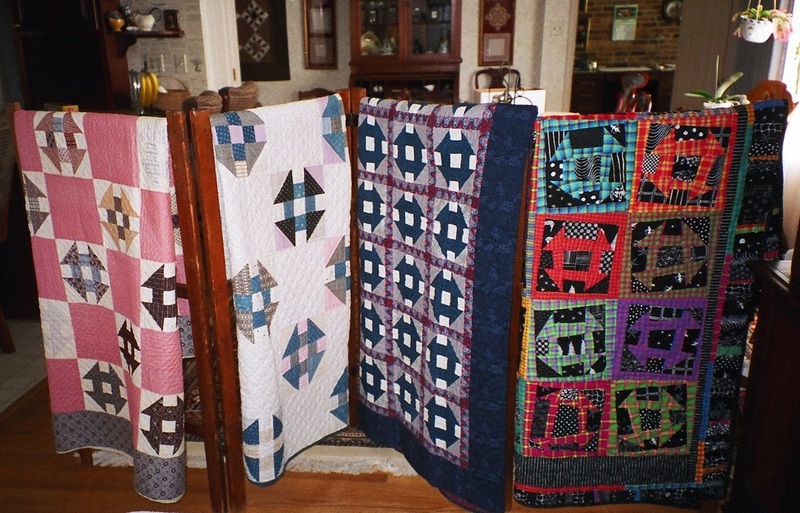 Quilts From Old to New: Many of these quilts combine old quilt blocks (mid 19th to mid 20th century) with new fabrics and were assembled by me between 1981-2002. This is my first quilt that combines old (19th Century) blocks with new fabrics. 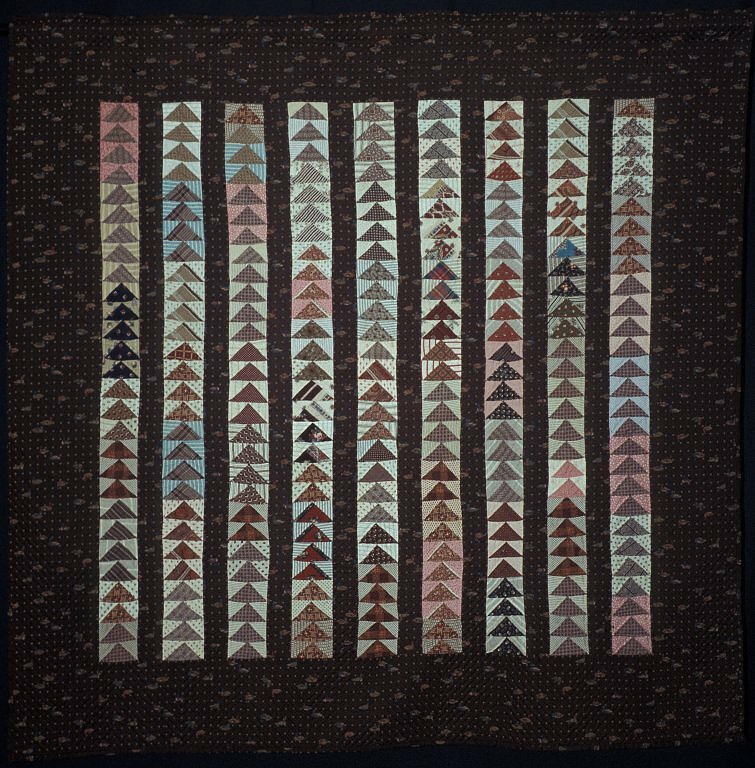 All of the triangle (flying geese) sections are old and the brown sashing and border fabric was new in 1981. There are small sitting ducks in this fabric. 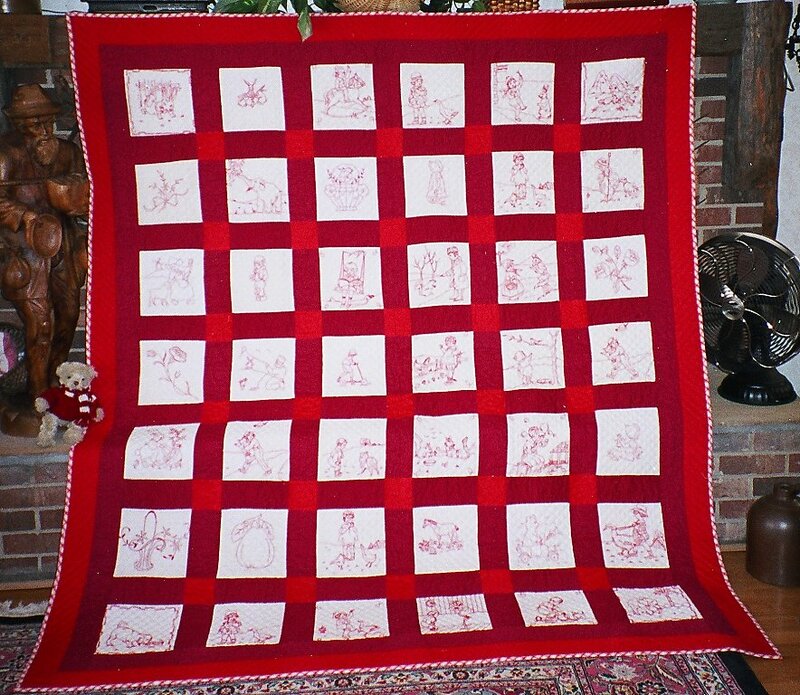 This quilt combines old depression era blocks (the baskets) with new materials in the set. The small muslin triangles and fabrics are from the 19thcentury. They are combined with new fabric. The dark outer border was purchased when we were on a cruise to the island of Ibiza in 1989. I purchased this old redwork top (c 1910-20) at the Lancaster quilt show one year. The label indicated that it was WWI Burgundy from Kempton, PA. The designs are from Kate Greenaway. 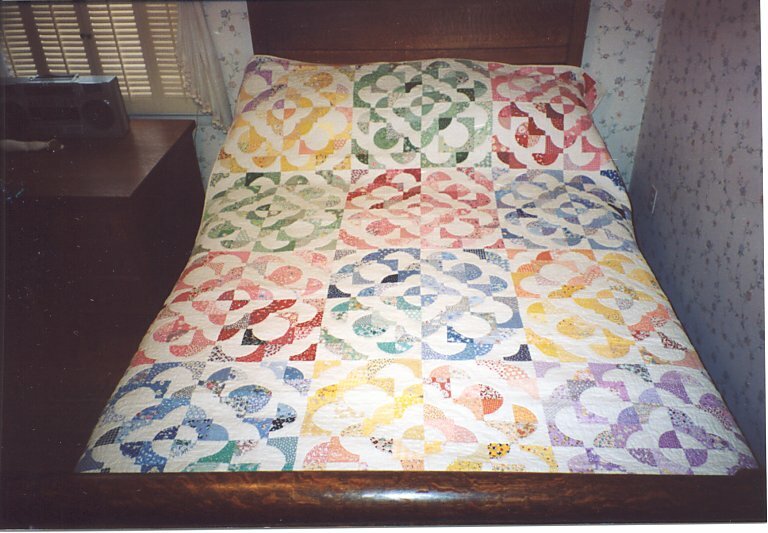 The sashing and borders had been poorly attached so that the quilt did not lie flat. I took it apart, reassembled it, and quilted it in 1990. 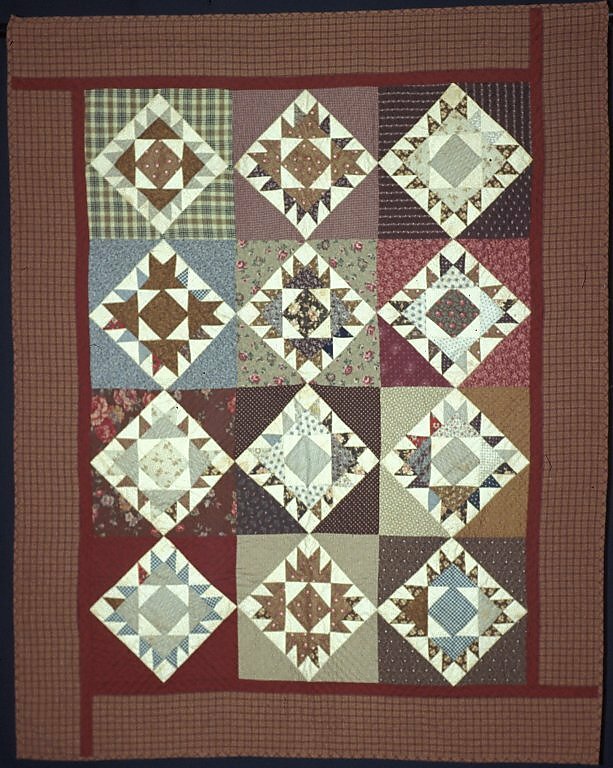 The name "Penny Quilt" is derived from the fact that patterns for the blocks used to be available for purchase for a penny. 19th Century blocks are set on point and framed in new fabrics. Mary Ann Rush liked the way I had set some other groups of old blocks so she gave these to me. Old Sunbonnet Sues were purchased at an antique shop in Strasburg, VA. They had been basted onto old muslin, but not finished. I had the pleasure of embellishing them myself and adding protest signs that form the cornerstones of this quilt. This was great fun for me and a nice break from all the sweetness represented in the other quilts using old blocks. The lettering was done by a friend, Sandy Miller. 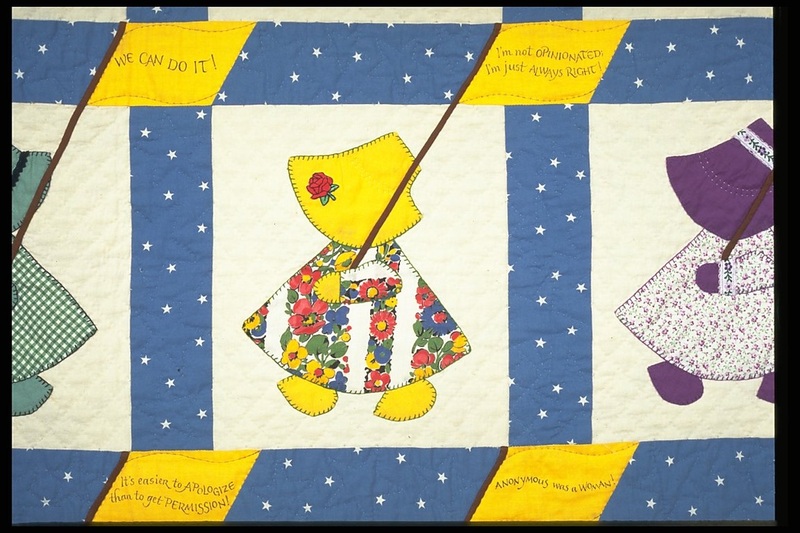 Quilt kits were an important part of quilting history in America in the early 20th century. The embroidered kit on the left, one of a pair, is called “Williamsburg,” and is Bucilla Kit #3022. My mother-in-law purchased the kits in about 1960 and then lost interest. I completed them and had them professionally quilted. The appliquéd one on the right is Bucilla Kit #1119, c1930. I purchased it in the original box in 1990. Three floral motifs had been stitched. I completed it in 1993. 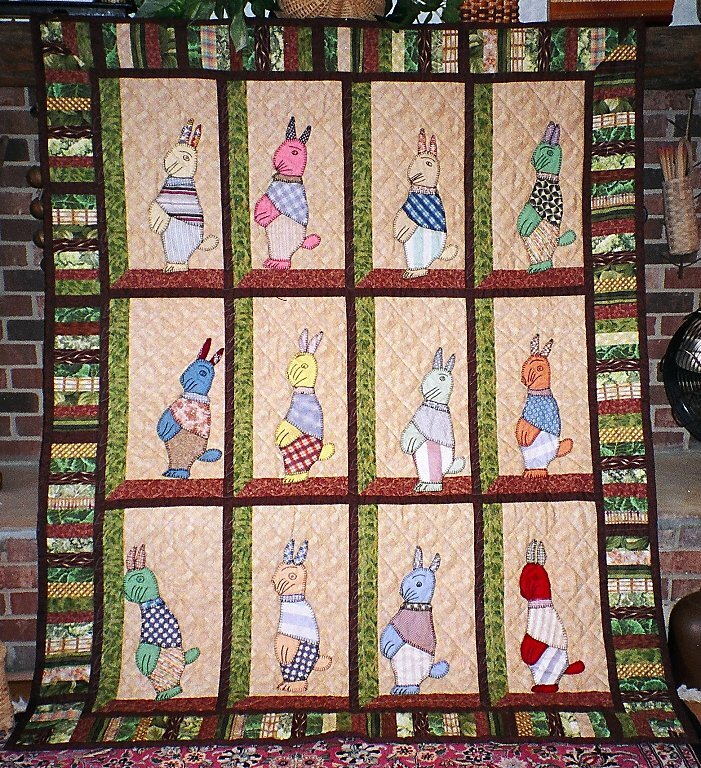 Very old basket blocks from Barbara Bockman are combined with new fabrics to make this quilt. The sashing looks simple, but turned out to be fairly complicated to assemble. This was made during a snowstorm in the winter of 1993. 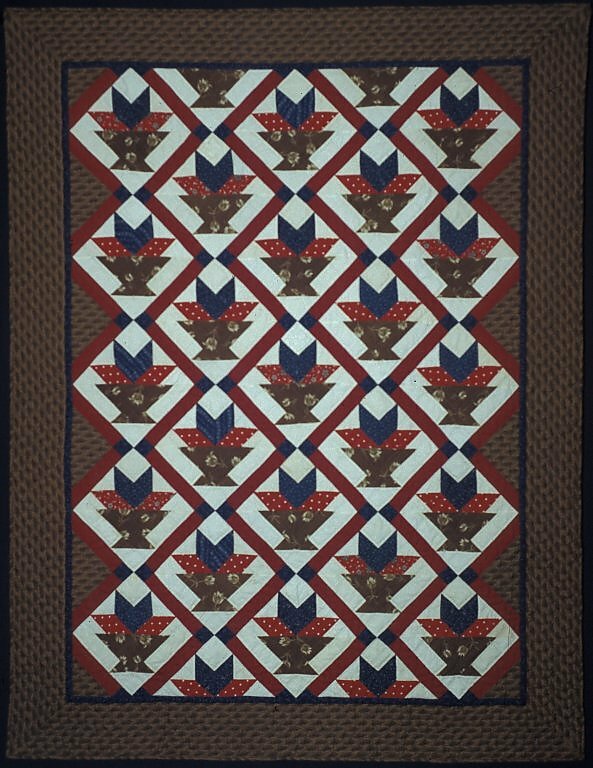 A quilt top purchased at Sully Plantation had dozens of different baskets made with fabric from about 1930. I took it apart, added sashing of new material and cornerstones from that era to make this piece. Each basket is different. These rabbits had been appliquéd to very poor quality muslin. I cut them off, leaving about ½” of the muslin around the outside and appliquéd them to new fabric. No doubt, the designer of this pattern had no idea that the pose was so suggestive. Machine quilted by Kathy Gray. 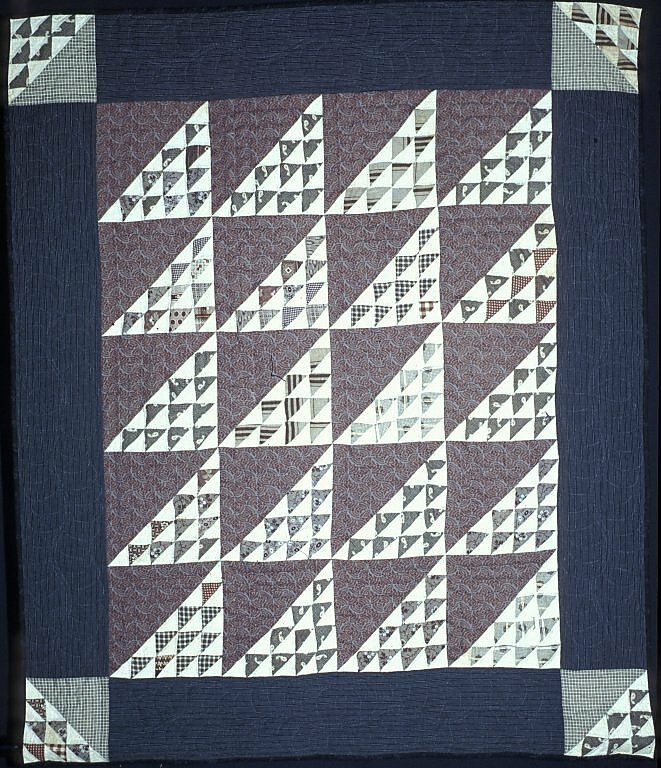 This curved two-patch quilt was made using depression era reproduction fabrics. In a book search I found this arrangement of blocks that was referred to as Aunt Polly’s Puzzle. It reminded me of my Great Aunt Polly who lived in Oregon and treated us nicely when my sisters and I were children. We teased her when we discovered that her job during the depression years was to stuff olives with pimientos. I wanted to make something beautiful in her memory. 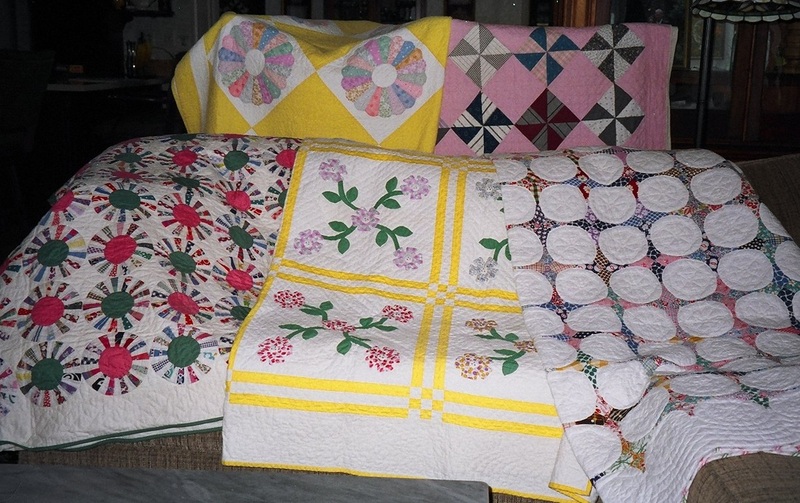 The Grandmother's Flower Garden blocks (foreground) are old ones from Iowa that have been appliquéd onto a background of depression reproduction fabrics. 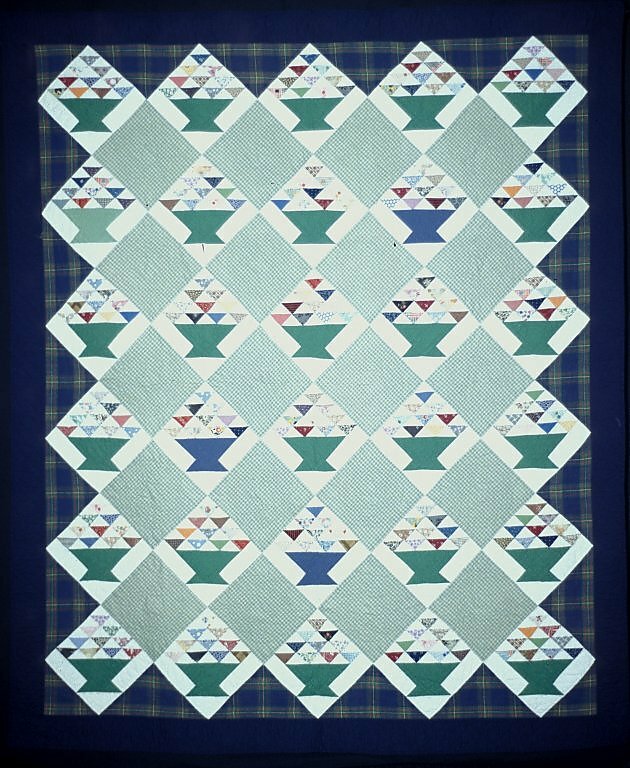 The Double Z quilt top was purchased in Kalona, IA, in 1987. One of the muslin blocks has the signature, Hattie L Harder, Feb. 3, 1877. I quilted the top in 1988. I recently gave a program on the changes in quilting in American during the last 200 years. 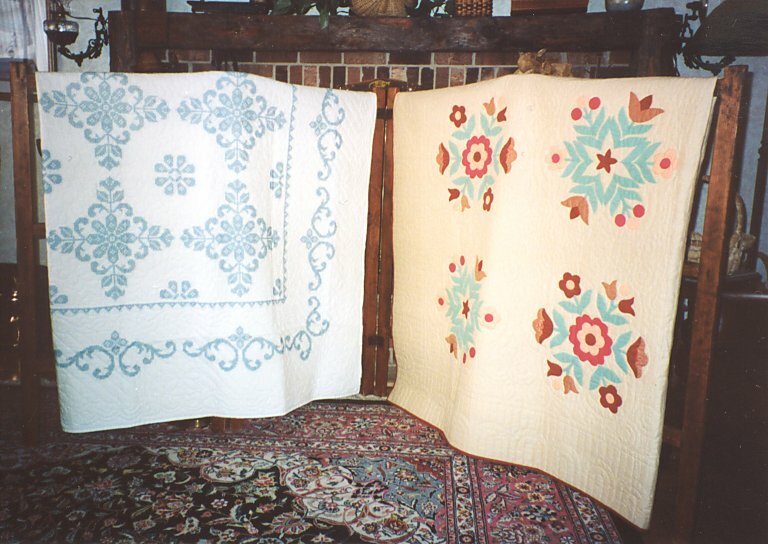 These four churn dash quilts, along with an old butter churn that was the source of inspiration for that pattern, were an important part of the program. They are, from left to right, a beautifully made 19th century quilt (c1880), a quilt top from about 1930 that I quilted, a quilt with churn dash blocks made by a friend’s mother from Iowa in about 1950 that I joined together with new fabric, and finally, an off kilter churn dash that I made in 2002 with bright contemporary fabrics. The one on the right was machine quilted by Kathy Gray. Front row, left to right, these quilts are: 1. A quilt top, referred to in the books as Wheel of Fortune and other names, that I purchased from a dealer in OK in 1991 knowing that I could take it apart, remove the joining blocks and reassemble it so that it would lie flat. 2. Appliquéd quilt blocks that I purchased, added borders to and made into a quilt, and 3. A Snowball/Hummingbird/Periwinkle quilt top that I quilted in 1991. 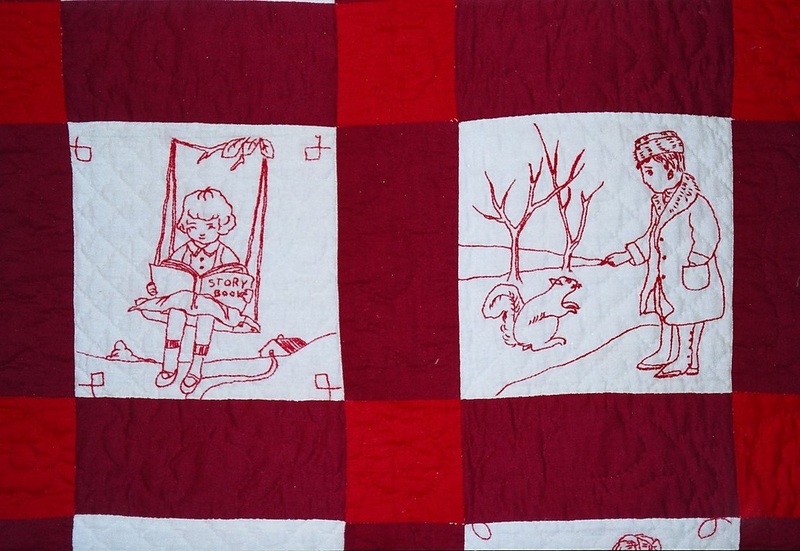 The top to this quilt was hand pieced by Lola Severns of Rochester. It is dated in the 1940s and came from Fulton Co, IN. 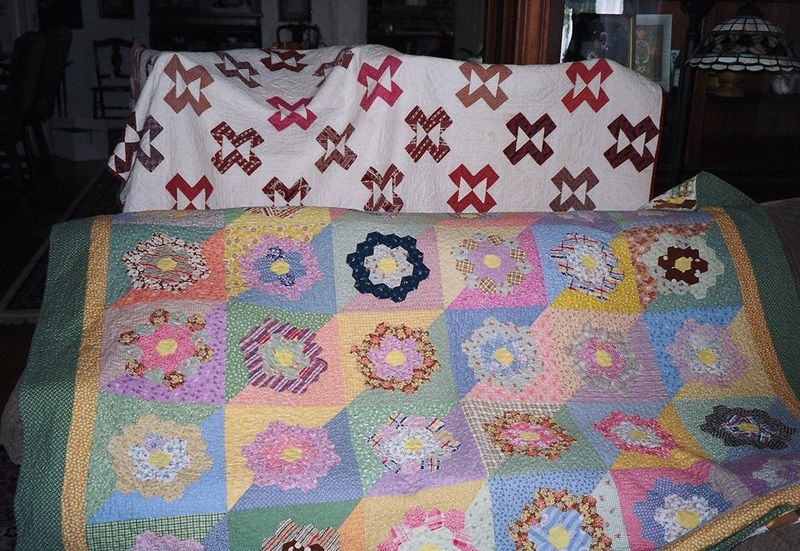 The hexagon quilt in the foreground was made by my Grandfather’s sister, Mae Hagenbuch, in Iowa in about 1925. She probably made it for her marriage, but since she never married, it remained unused. 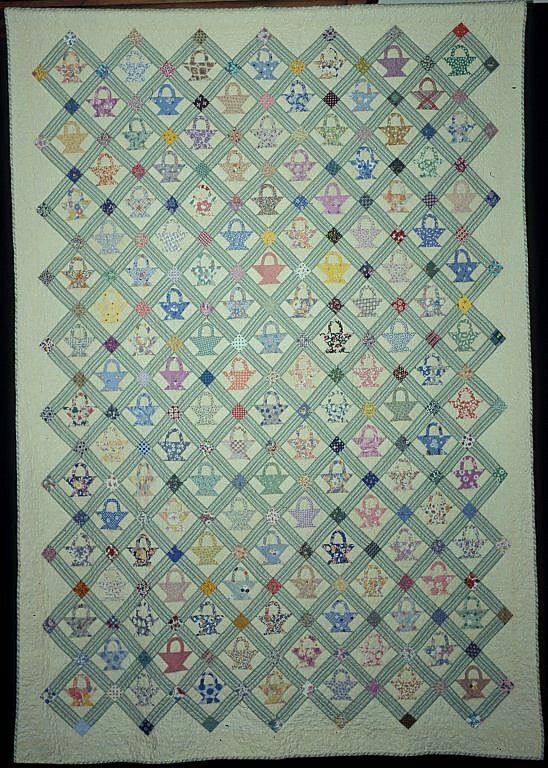 The Double Wedding Ring quilt was a gift to me from my mother-in-law in about 1970. She purchased it new in Waterford, VA. 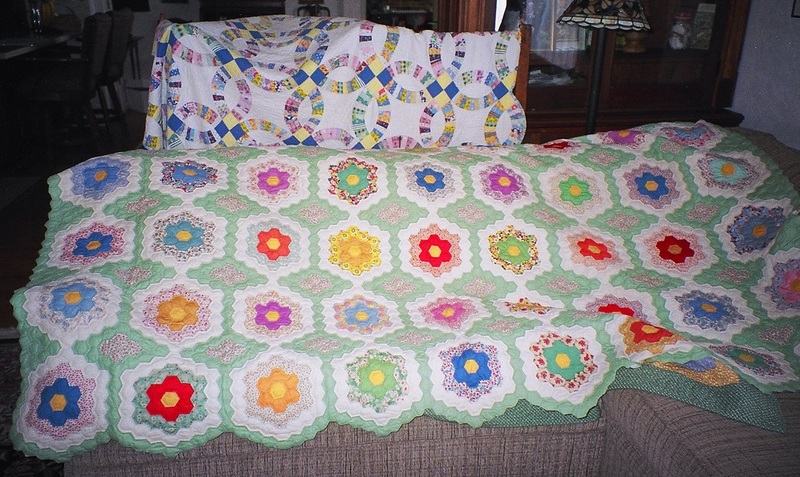 The irregular hexagon quilt on the left is almost a charm, but there are a few repeats. I bought the top at a bargain price then wondered why I did. I was equally unenthused about the backing and the basting. As I was quilting it, I felt connected to the original maker and like the finished product. The Postage Stamp quilt represents my inheritance from my Dad. He was a small town country doctor in Eastern Iowa. One year a patient, John Hopson, came in at the end of the year (c 1945) to “settle up.” Since Dad had given more services than the family could afford, he gave Dad the quilt and much garden produce as payment of his bill. 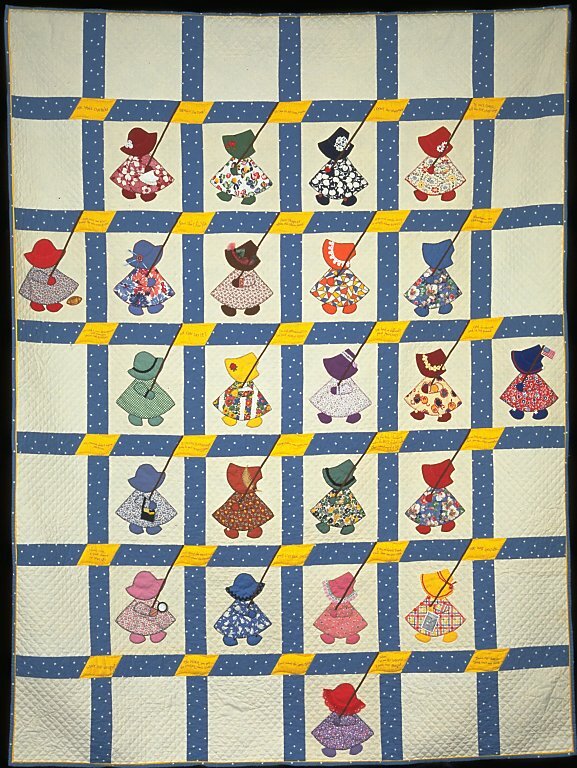 This undated quilt top is typical of fundraiser quilts from the late 19th or early 20th century. In this case, church members purchased a piece of tape that they signed. One person probably assembled the top. It is sometimes referred to as a tithing top and came from Emmanus, PA. The pattern reminds me of snowflakes. 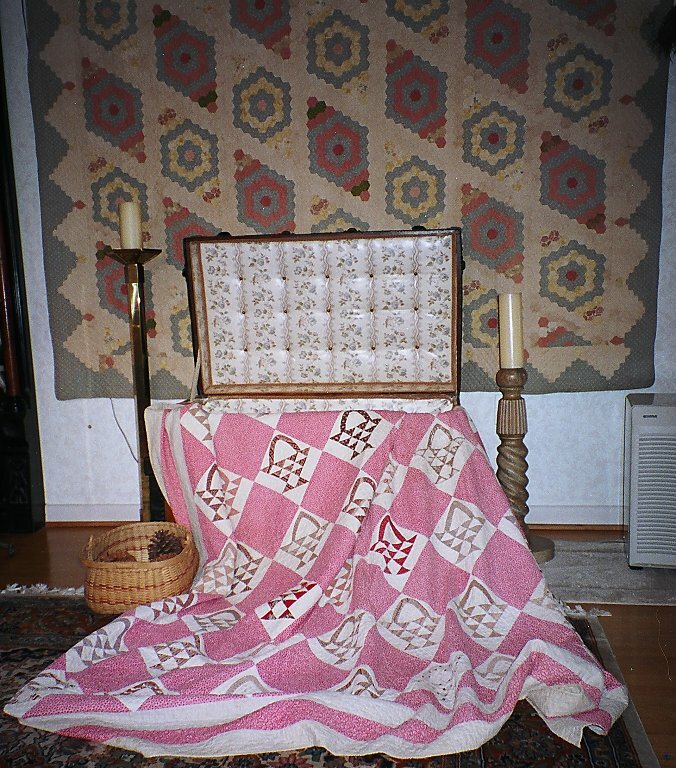 The pink basket quilt was made in about 1850 and came from the estate of Mary Green, Poolesville, MD. The quilt on the wall was made by Mary Virginia Langstun (b1849-d1908). It was made in either Southern Virginia or North Carolina. It is set like a grandmother’s flower garden but has added hexagons giving the impression of large diamonds. 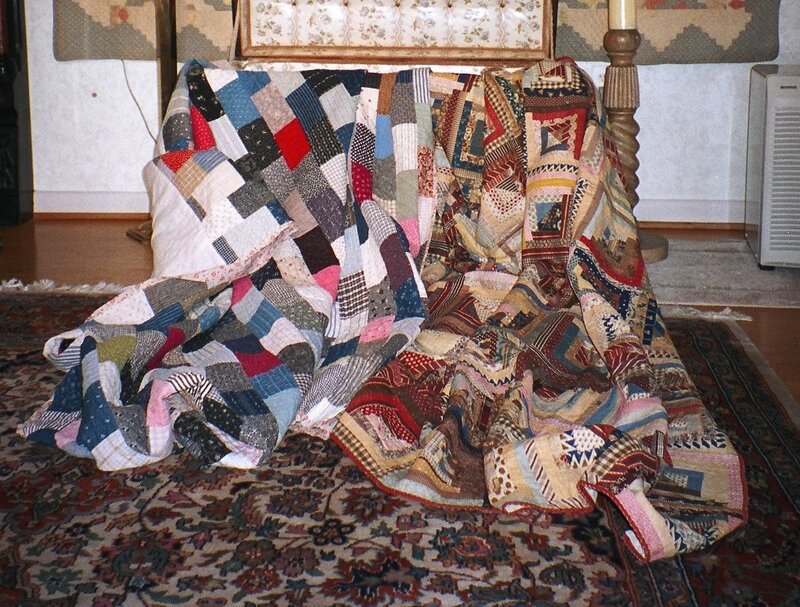 The old quilt on the left is called a Brick pattern since, do doubt, the blocks are the size and shape of bricks. 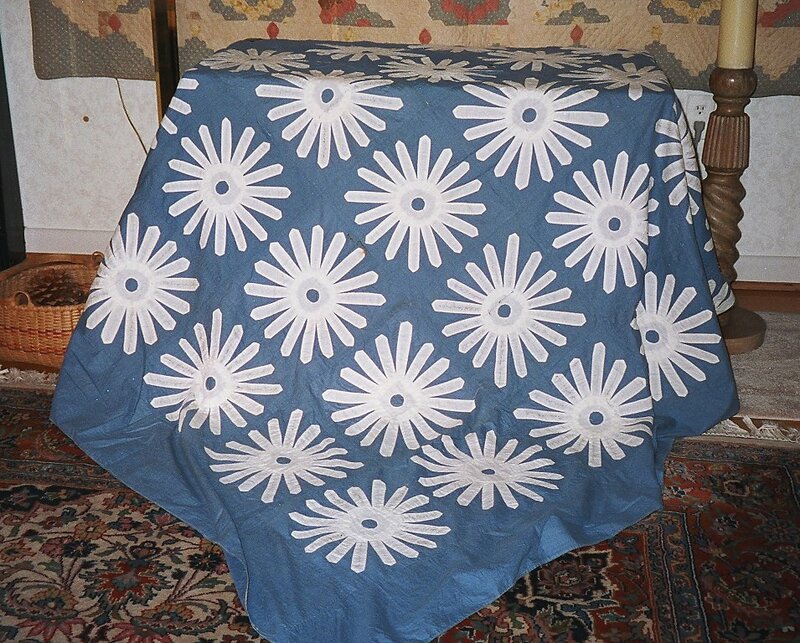 I purchased this quilt in Kalona, Iowa, in 1987. It is almost a charm quilt but there are some repeats. One thing I love about it is the strip of muslin along the top. This is called a beard guard and was used to protect the quilt from the beard of the Amish man whose wife probably made the quilt. 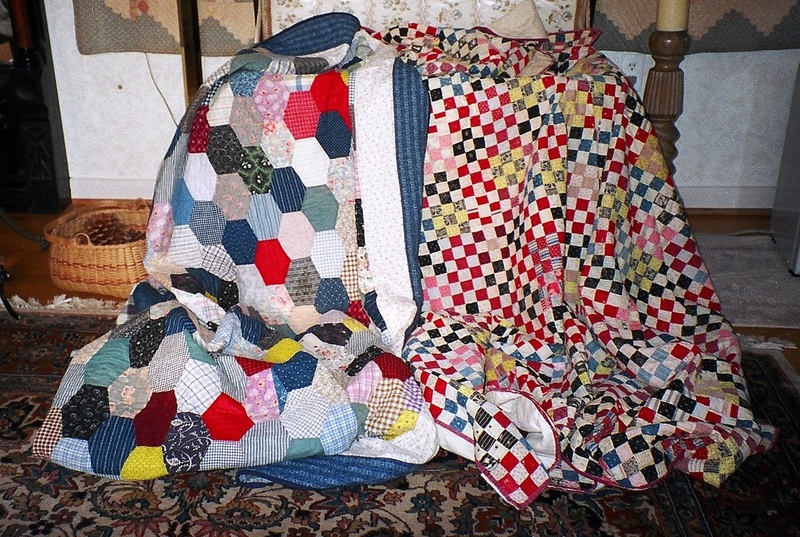 The quilt on the right is a gorgeous Log Cabin quilt that was made sometime in the 19th century. I once had an expert on fabric dyes look at it and he said that the dyes were all made from vegetables. It has the name “SECary” inked in on three of the corners. I purchased this quilt in 1982 at an antique shop in Aldie, VA.